Growing solidarity between the Left and the Islamists deserves scrutiny; this weblog entry will provide some of the more colorful and interesting examples. The Reverend Edwin Bacon, Jr.
Sept. 19, 2003 update: The Muslim Public Affairs Council announced today the honorees at its 12th Annual Media Awards, to be held on October 16, 2003. The lead name is that of Michael Moore, the far-leftist who so annoys conservatives that he achieved a second-place finish in Little Green Footballs' Idiotarian of the Year contest for 2002, just losing out to Jimmy Carter for the coveted Robert Fisk Award (known as the Fiskie). Sept. 20, 2003 update: CAIR's Ohio chapter announced today that it has been selected to receive the American Civil Liberties Union of Ohio's (ACLU-Ohio) annual Liberty's Flame Award for "contributions to the advancement and protection of civil liberties." The president of CAIR-Ohio, Ahmad Al-Akhras, commented that "This award is a tribute to the hard work and dedication of CAIR-Ohio's staff and volunteers." Oct. 3, 2003 update: The Cleveland Plain Dealer reports that Rep. Dennis Kucinich yesterday announced that he will not be attending the above CAIR fundraiser. Said his spokesman, claiming that the congressman had accidentally been booked in two places - a San Francisco event honoring and the CAIR banquet - "He has a scheduling conflict and is not going to be able to speak at the [CAIR] rally after all." On a related subject, Kucinich yesterday finally got around to returning the $500 he received from the now-jailed Abdurahman Alamoudi, money given for his long-ago election campaign of 1997. Interestingly, Kucinich did so only after being informed by Cleveland Plain Dealer reporter Stephen Koff of Alamoudi's arrest several days ago. Oct 29. 2003 update: CAIR announced today that Dennis Kucinich will be the keynote speaker at its Ninth Annual Fundraising Dinner on November 29th, taking place in Tysons Corner, Virginia. Let's see if Kucinich actually turns up this time. Should he do so, he will be speaking along with Imam Siraj Wahhaj, one of the "unindicted persons who may be alleged as co-conspirators" in the attempt to blow up New York City monuments a decade ago (according to U.S. Attorney Mary Jo White in a letter dated Feb. 2, 1995). Nov. 30, 2003 update: CAIR announced today that Kucinich did turn up at its dinner last night, so the consumation of the far Left bond with militant Islam can now be said to have been achieved. Dec. 2, 2003 update: MPAC announced today via e-mail that Pacifica Radio's Los Angeles affiliate, KPFK will co-sponsor the MPAC Convention on Dec. 20-21. Arab News asked Cohen whether he was worried that his anti-American stance could be misunderstood and incite more violence and hatred against Americans and American interests in the Kingdom. "The American people are good, simple people. It is the American administration that is creating problems for Muslims and Arabs. I encourage Arabs and Muslims everywhere to take all legal, peaceful means of resistance. Vote for anyone but Bush, write letters, join protests, do anything you can. Nothing is more precious than human life. I do not advocate violence of any kind toward anyone." Cohen is saddened by the exodus of over 100,000 Muslims from America after Sept. 11. "There has been a dramatic decline in the number of new immigrants to America. There has been a drop in the number of Asians, Africans and Arabs coming to the US. New immigrants always bring energy, dreams, hard work, growth and revitalization to the US. As an American Jew, I feel America needs Muslims." Dec. 21, 2003 update: And MPAC ♥ the Left, too. The organization released today via an e-mail titled "American Muslims Making Voice Heard in Presidential Politics," the results of a straw poll held at its annual convention in which some 82 percent of the 800 convention delegates took part. The results? Howard Dean received over 67 percent of MPACers' votes, Dennis Kucinich 17 percent, Wesley Clark 8 percent, John Kerry 4 percent, and George Bush 2 percent. Dec. 23, 2003 update: Reuters quotes one MPAC delegate, upon hearing these poll results, responding with "How did Bush manage to get 2 percent?" Jan. 17, 2004 update: Forty-one Arab-American and Muslim organizations signed a letter to "International A.N.S.W.E.R." endorsing its March 20, 2004 call to demonstrate against "all colonial occupations from Iraq to Palestine to everywhere." Organizations of note include Al-Awda, American Muslims for Jerusalem, five chapters of the American-Arab Anti Discrimination Committee, Islamic Association for Palestine, and the Muslim Students Association of the U.S. and Canada. Jan. 21, 2004 update: Another ninety-nine mostly Arab and Muslim groups signed on in solidarity. March 5, 2004 update: In an undated statement, the far-left Tides Foundation announces that is is funding CAIR's "Interfaith Coalition Against Hate Crimes" project with the ostensible aim to promote peaceful co-existence between Muslims and non-Muslims and decrease tolerance for anti-Muslim hate crimes. May 9, 2004 update: The Seattle Times reports on a CAIR event last night in Seattle at which Rep. "Baghdad" Jim McDermott (Democrat of Washington State) received the organization's public-official-of-the-year award. May 24, 2004 update: CAIR announces today that Ralph Nader will speak at the organization's Maryland & Virginia branch Annual Fundraising Banquet on June 5. June 17, 2004 update: For an illustrated complement to this entry, see "The Leftist-Islamist Alliance in Pictures." July 8, 2004 update: MPAC gave its much-sought after annual media award last year to Michael Moore (on which, see the Sept. 19, 2003 update, above). This year, the reward to a "voice of courage and conscience" is being given Alec Baldwin on August 21, 2004 in Los Angeles. Having endured my worst television show ever, on the late, unlamented "Politically Incorrect," with Baldwin and a MPAC honcho, I can vouch for this being a match made in heaven. March 27, 2005 update: Former Vice President Walter Mondale spoke at the regional convention of the Muslim American Society in Minneapolis, giving his imprimatur to one of the most dangerous Islamist organizations, one that makes few bones about its intent to turn the United States of America into, as I have dubbed it, the Islamic States of America. May 26, 2005 update: The Interfaith Alliance, a left-wing group (that, among other things, opposed my appointment to the U.S. Institute of Peace board) has various chapters; the Iowa one is holding its annual dinner today and who should be delivering its keynote address but Ibrahim Dremali, the Boca Raton imam who recently left Florida when accusations of terrorism ties made it too hot for him. Now, for the first time in history, the political left is working with conservative Muslims on issues of social justice, with the long-term goal of building a world that lives by peace, through justice. Communists, Marxists, socialists, and nationalists are working with civil libertarians, liberals, and conservatives to achieve this urgent goal together. July 14, 2008 update: I published a major analysis of the red-green alliance today in the National Review, "[The Islamist-Leftist] Allied Menace." Nov. 18, 2008 update: The Muslim Student Association at Northwestern University has invited unrepentant leftist terrorists William Ayers and Bernardine Dohrn to talk at an event called "Peaceful Progress: A Discourse on Affecting Change" – neatly illustrating the thesis of this weblog. Apr. 26, 2009 update: The Capacent Institute asked Muslims in Denmark, "Which party would you vote for if there were elections now," and the leftist parties (the Social Democratic Party, the Social Liberal Party, the Socialist People's Party, and the Red-Green Alliance) in the aggregate won 89.1 percent of their votes. In contrast, 5.7 percent would support the Liberal Party and a mere 1.1 percent back the Conservatives. Only the Social Liberal Party wins about the same support among Muslims (5.8 percent) as the rest of the population (5.1 percent). May 25, 2009 update: According to a secret 3-page Israeli report leaked to the Associated Press, the Venezuelan and Bolivian governments are sending uranium to their Iranian friends; if true, this brings the Left-Islamist alliance to an entirely new level. The report argues that Hugo Chavez, the president of Venezuela, hopes to undermine the United States by supporting Iran. Aug. 7, 2009 update: A political sciencist at Växjö University in Sweden, Magnus Hagevi, reports on a survey he conducted of 747 Muslims living in Sweden, where he found them to be "a homogeneous political-party voting group." 70-75% of Swedish Muslims sympathize with the Social Democrats. In total the Red-Green Block [ed: Socialists/Green] gets 80-90% of Swedish Muslim sympathies. The right-wing parties together get just 10-20% of the Muslim vote. He finds that religious identity explains this voting record much better than does economic class or any other factor. Despite their overwhelmingly leftist voting record, Hagevi finds that "Swedish Muslims are not characterized by having leftist views." Also today, IPT News published "The Enemy of My Enemy," which documents a "disturbing trend" emerging in the United States: radical Islamists are finding new allies among a extreme leftist groups, and it provides details about Interreligious Foundation for Community Organizations/Pastors for Peace, Charles Barron, Movimiento Estudiantil Chicano de Aztlan, and La Voz de Aztlan. The analysis concludes: "Radical non-Muslim ethnic groups and hard-core leftists seem to be jumping on the jihadist bandwagon. It's an alliance that demands closer inquiry." Ilhem Moussaid, Marxist candidate in hijab. Feb. 8, 2010 update: The Nouveau parti anticapitaliste (NPA, New Anticapitalist Party), founded in February 2009, is an extreme-left political organization connected to Olivier Besancenot, formerly of the Ligue communiste révolutionnaire (Revolutionary Communist League). 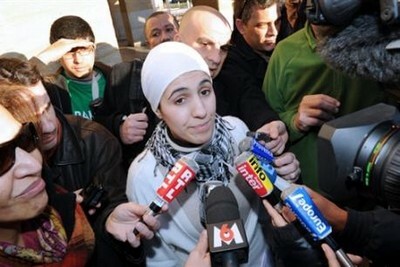 To the surprise of many, the Marxists nominated a woman in hijab, Ilhem Moussaid, 21, for a regional seat in Avignon. She declared herself a "militant feminist, internationalist, and anticapitalist." and so a fitting NPA candidate. Comment: Will the NPA become a French version of the British "Respect"? 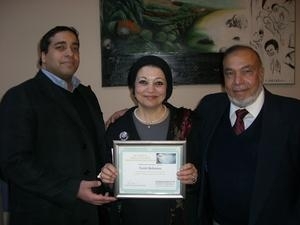 Left to right, Mehanna's brother, Tamer, mother, Souad, and father, Ahmed, with the esteemed award in hand. Jan. 6, 2013 update: The Community Church of Boston calls itself "a free community united for the study and practice of universal religion, seeking to apply ethical ideals to individual life and the democratic and cooperative principle to all forms of social and economic life." Translated into English, that means it's a fringe leftist organization, as the recipients of its Sacco & Vanzetti Social Justice Award confirm. 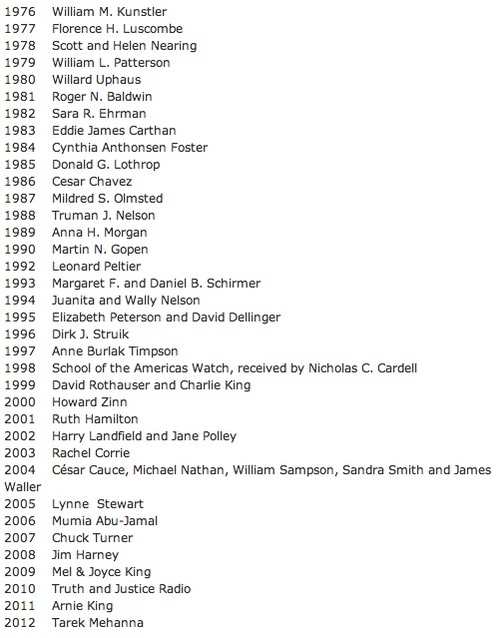 Their numbers (see the full list below) include such luminaries as William Kuntsler, Leonard Peltier, Howard Zinn, Rachel Corrie, Lynne Stewart, and Mumia Abu-Jamal. And this year, outdoing itself, the church bestowed its 36th award on convicted terrorist Tarek Mehanna, currently serving a 17 ½-year prison term. According to a story in the MetroWest Daily News, the church's congregational director, Linda Jenkins, "called the evidence against Mehanna 'laughable' and suggested the real reason for his arrest was that he was a politically outspoken Muslim who refused to collude with the FBI." A complete list of Sacco & Vanzetti Social Justice Award winners. 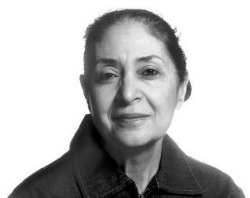 Shams Ghoneim, president of MPAC's and ACLU's Iowa chapters. May 28, 2013 update: Two left-wing legal groups, Public Citizen (founded by Ralph Nader) and the Center for Constitutional Rights, are representing "terrorist inmates" such as ex-CAIR spokesman Randall Royer and other Islamists.